PHOENIX, Arizona — U.S. Highway 89 south of Page has reopened to traffic for the first time following a Feb. 20, 2013, landslide that caused catastrophic damage to the roadway, requiring a 23-mile closure between the junction of state Route 98 in Page and U.S. Highway 89A near Bitter Springs. In order to reopen Highway 89, the Arizona Department of Transportation completed an extensive $25 million repair, which included removing approximately 1 million cubic yards of rock material to realign a 1,500-foot section of roadway and construct a downslope rock buttress at the base of the Echo Cliffs to stabilize the area. School buses from the Page Unified School District were the first vehicles to pass through the newly rebuilt roadway Thursday. For more than two years, community members – including school children – of Bitter Springs, Marble Canyon and Cedar Ridge have used alternate routes, including the Temporary U.S. Highway 89 route that was opened in August 2013, to and from the Page and Lake Powell areas following the Highway 89 landslide. Highway 89T, which served as the primary detour route to connect to the Page and Lake Powell areas following a $35 million project to upgrade Navajo Route 20, is expected to be relinquished to the Navajo Nation on April 17 when the State Transportation Board convenes in Phoenix. The 44-mile route was mostly a dirt road before being paved during a three-month-long project in summer 2013. 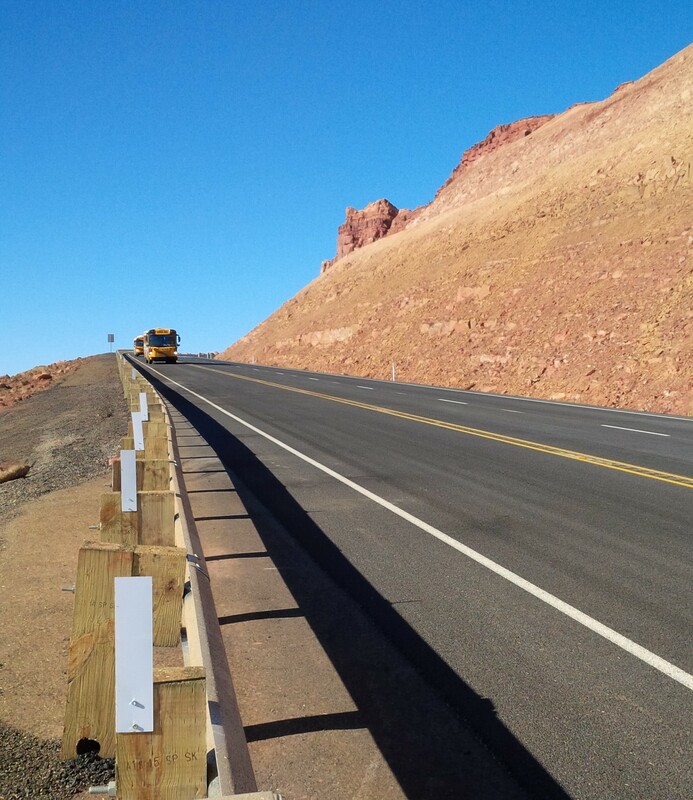 Prior to starting the Highway 89 landslide repair in summer 2014, ADOT had to clear several significant hurdles to keep the project moving forward. After an extensive geotechnical assessment identified the necessary repairs in July 2013, ADOT retained an engineering firm through an innovative construction delivery method (Construction Manager at Risk), which allowed the contractor to work directly with the design team and develop plans for the eventual repair. ADOT and the team also finalized all federally required environmental reviews that included cultural, biological and water quality measures, and completed plans for the required right-of-way easements with the Navajo Nation. The Highway 89 landslide repair project is eligible for reimbursement through the Federal Highway Administration’s emergency relief program, which provides funding to state and local agencies for the repair or reconstruction of highways, roads and bridges that are damaged in natural disasters and catastrophic failures.